On Father’s Day: Say I Love You to Him in Chinese! As a well known Chinese children’s song goes: “Mom is the best in the world. A kid will feel treasured when with mom…”, the role of mother has always been great to family life. This article describes what’s it like being a mom in China. Yet, this also reveals the fact that father’s day, which is today, is not a widely celebrated holiday here. Do you know how to say I love you to him in Chinese? For me, I always remembered to send a gift with a message to my mom on the second Sunday of May, yet I often have to check the calendar to remind myself when it’s Father’s Day. I felt a little sorry for my dad, but I am sad to say I’m not the only one in China that does this. 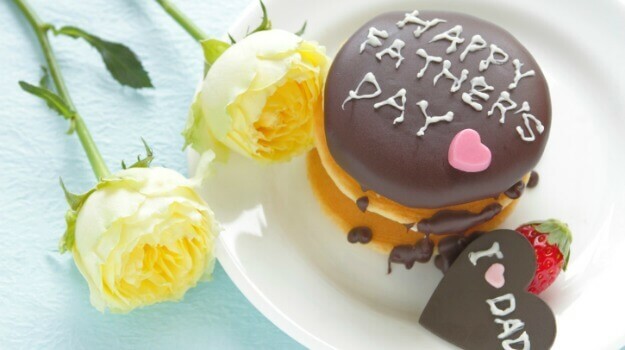 According to research, only 16.8 percent of the Chinese know what day is Father’s Day, while 20.6 percent know the exact date of Mother’s Day, 56.1 percent know when it’s Valentine’s Day and 53.4 percent know Christmas. It was carried out by Horizon China in 2002. Although a little out of date it shows that I am not alone in my behavior. 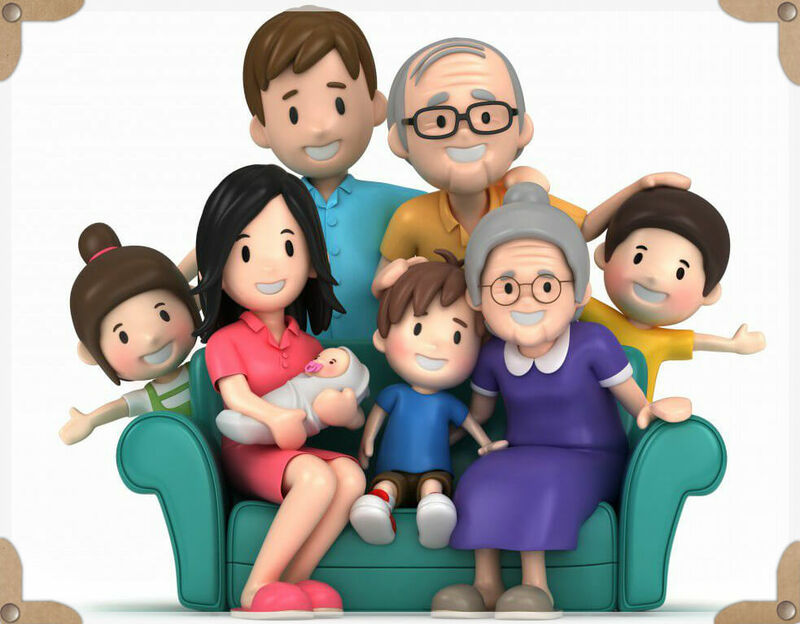 But, just like the fact that traditional Chinese philosophy always believes that the world is balanced with two different elements: The Yin and Yang, the positive and the negative, the sky and the land, etc., father, as the counterpart of mother, will never be missed out in the topic of family life. 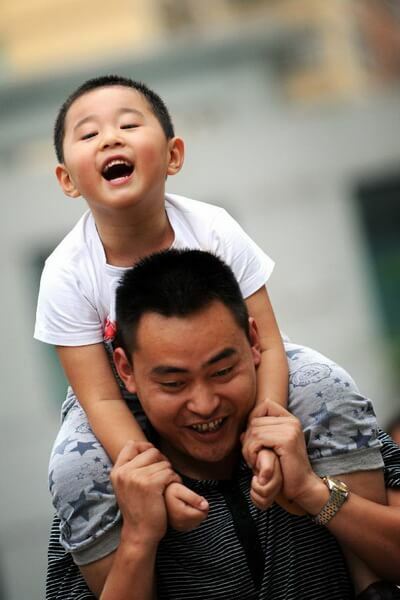 What does father mean to a family in China, traditionally and in modern life? 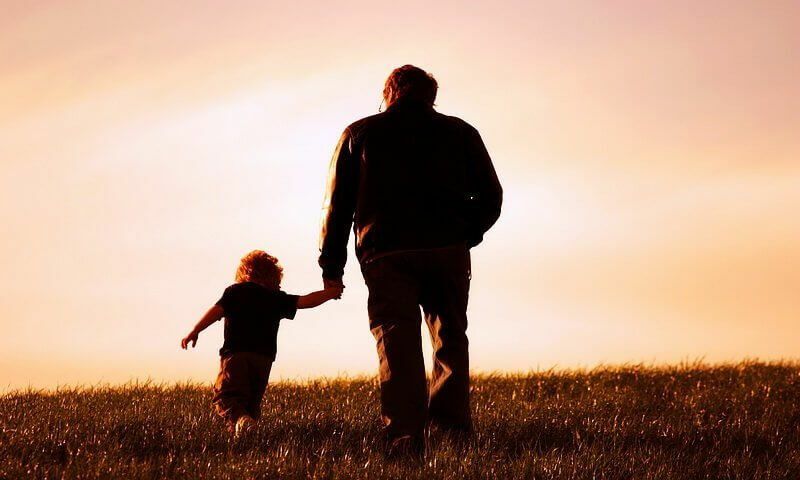 Children would pay great respect to their fathers. A core belief in traditional Chinese thought is the concept of “忠” and “孝”, which stands for “loyalty” and “filial piety”. The former is for the emperor (or leader), the latter is for parents. To achieve “孝”, one must be fully respectful to their parents, take care of them and do whatever they instruct us to. Of course, this can sometimes get too much and intense. But generally speaking, this moral obligation helps to maintain a very close relationship inside the families in China. 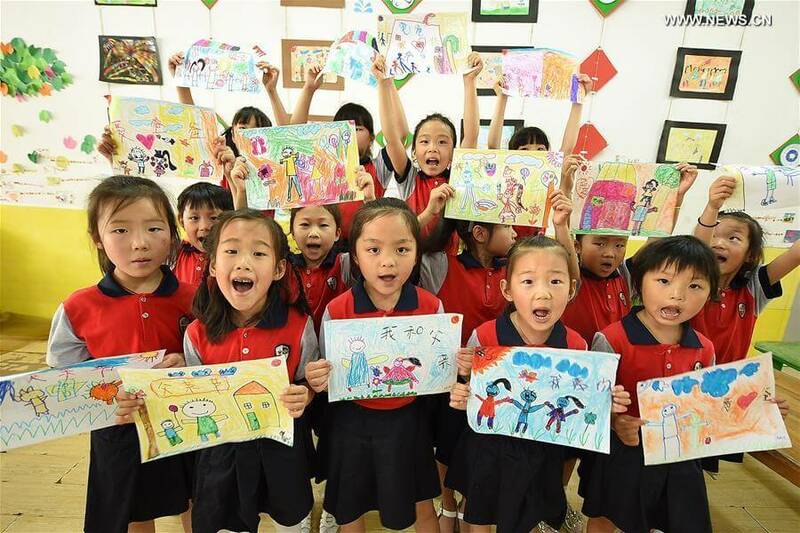 Back to our topic, for most of the families in China today, both parents are of the same importance, however, a large proportion of the childrearing still falls upon the mother. As the father spends more time out working and mother tend to stay at home to take care of the kids and manage the household. In China, we have a saying, “父爱如山” （fù’ài rúshān） or “ a father’s love is just like the mountain: It is vast, but silent”. Some dads may indeed fit this stereotype and show love in other ways rather than direct nurturing and actively speaking with their child. This might be the root cause as to why a lot of children forget about fathers day. How do we say dad in Chinese? Your dad is today’s star! But as a Chinese learner, let’s first go over the different ways you can use to call your dad! Maybe 爸爸 (dad) is one of the first few words you learned in Mandarin Chinese classes. But there are other ways to say “dad”! Dad, the most commonly used word for dad. It can be used in both informal and formal contexts. Daddy, a more intimidating way to call your dad. This is for daily conversations usually within the family or between close friends. Father, the formal way to say dad, often appears in written text or used in formal occasions. This is from the ancient Chinese and is not frequently used. Some people might consider it as a slang dialect. This is the most respectful way to say farther. Interestingly, people only say this to refer to the father of the person they are talking to. zánmen jīntiān chūqù chī ba! wǒ qǐng nǐ. Bà, zhè shì nǐ de fùqin jié lǐwù. 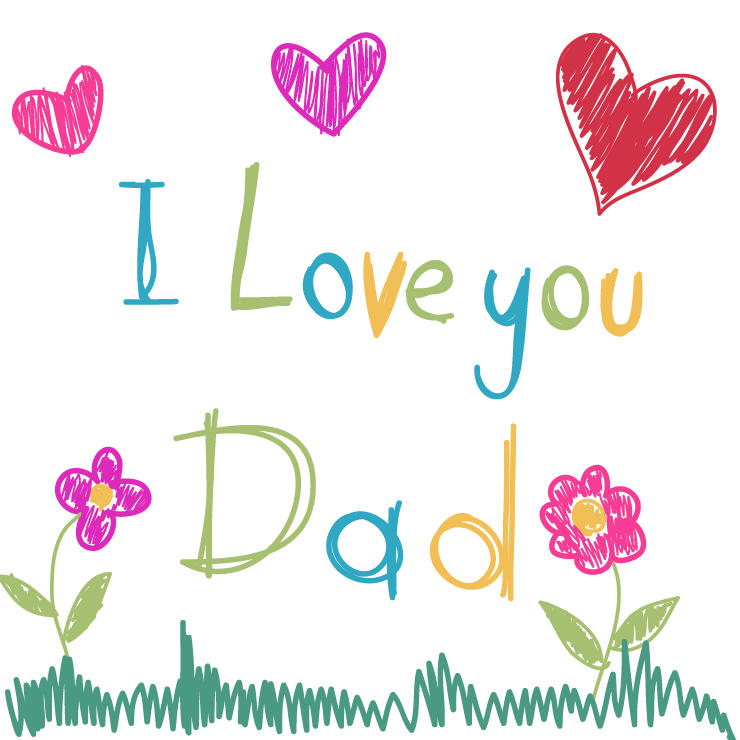 Finally, we don’t want to miss the chance to say the word love to our dads, here’s how you can express your love. So how do people celebrate this holiday in China? It is common for families to have a meal together to celebrate this day, just like many other family holidays. Parents of young kids may take their kids to the park or an amusement park. Grown-ups will spend some time visiting their parents. A picture of their father drawn by their children will always be a precious gift for this day! And there will be many fun father-child activities being held. 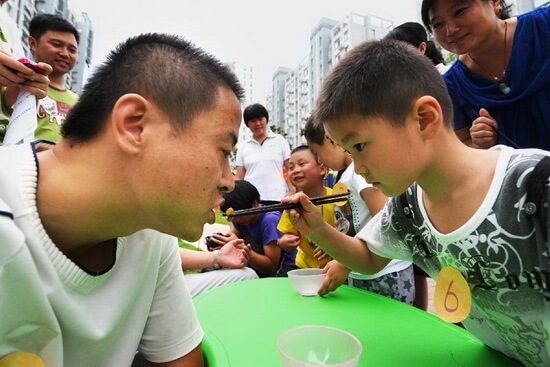 A boy gives beans to his dad in a father-child sports meeting. Kids and their dads compete in groups. 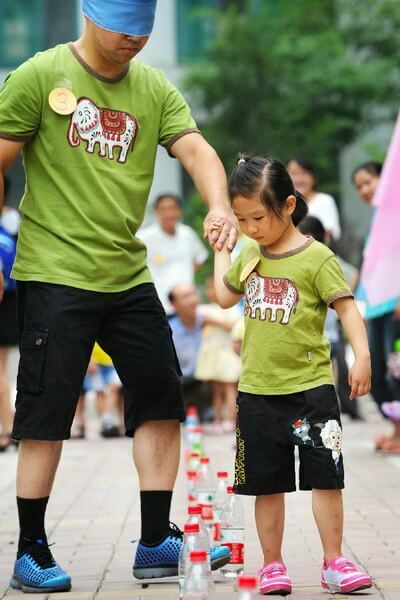 A little girl leads her masked dad in a game. In the end, it’s his day. No matter how you are planning to celebrate, always remember one thing: Put a smile on his face.